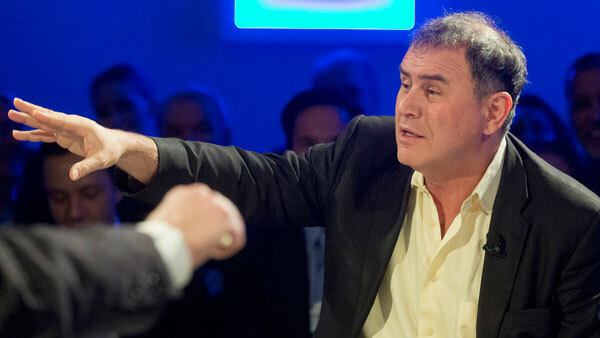 Nouriel Roubini sees the global economy as a four-engine jetliner with only one operational engine: the "Anglosphere" of the U.S. and U.K.
Nouriel Roubini sees the global economy as a four-engine jetliner with only one operational engine — the “Anglosphere” of the U.S. and the U.K.
As for the markets, he notes the growth in volatility and declares that “a correction is still underway,” and that some recent bad macro news — which can be good for markets — is, in the present case, bad for the markets, because of the perception of policy inertia. The Japanese engine, he says, “is running out of fuel after a year of fiscal and monetary stimulus.” Prodded by a 7.1% annualized decline in GDP in 2014’s second quarter, the Bank of Japan decided last week to initiate in 2015 a major round of quantitative easing of its own, increasing its balance sheet by 15% of GDP per annum and extending the average duration of its bond purchases from seven years to 10 years. The stock markets in Japan and the U.S. rose in response, but the yen fell sharply against the dollar. However, those risks — everything from strife in the Middle East and Hong Kong political instability to Ebola and climate warming — are slowing down both capital spending and consumption.